Coffee, does it really need any introduction? The sweet black liquid that can give you a nice kick at the beginning of the day? What can we say, we, just like many of you are addicted to coffee. There are zillions of articles throughout the internet about the benefits of coffee drinking and equally as many about the adverse effect of coffee consumption. Take your pick. According to recent studies by US neuroscientist Steven Miller the best time to drink coffee is not right after you wake up, but an hour or so later. In our opinion any time is good to have a coffee. Why not come to Roots to pick up a nice cup of Latte to go? Or why not take a small break before heading out to the slopes or just come and have an afternoon flat white with some live music? We use dark roasted beans in our freshly brewed coffees from Key coffee. 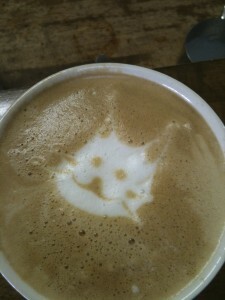 All our coffees are freshly made by our lovely baristas. Here is Cassie with her cattucino creations in winter 2015. 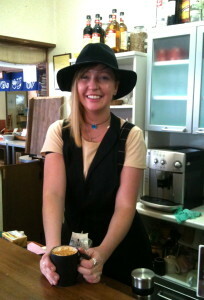 We serve espresso-based coffee drinks. Our coffee is the best in town! But don’t take our word for it, come and have a cup or two while listening to this maybe.